If you can't tell by his name, Meathead Goldwyn is into all things pork. He's the editor of the barbecue fever-dream website AmazingRibs.com, the author of The Science of Great Barbecue and Grilling, and a bona fide barbecue judge for multiple food contests around the world. That’s why he’s our go-to guy on how to grill pork. Meathead's a strong advocate of two-zone cooking, which means he likes to set up the grill with a hot zone and a cold zone. This can be achieved by piling coals up higher on one side for a charcoal grill, or leaving the burner off on one side for a gas grill. This gives you a ton of temperature control. Also crucial? A good digital thermometer. The baby back ribs are the curved bones along the spine and they're about 5-6in long. The center cut is from the bones that run down the side of the animal. 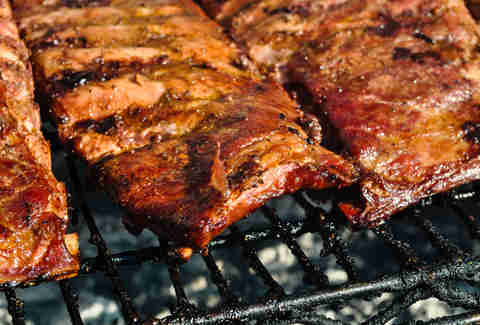 Spare ribs include the softer, cartilage-heavy rib tips that connect to the bottom of the center cut. When the tips are removed from the rest of the ribs, it's called the St. Louis cut. These are all great on the grill, though they are fatty. But that fat is unctuous, that's flavor. That's ribs, folks! If you don't like fat, don't buy ribs. Grill it up: Cook them over indirect heat at a low temp with a little smoke. A good number to shoot for is around 225 degrees. You want to melt that connective tissue, which can become really tough if you cook your ribs too hot and fast. Leave 'em on the grill for about three to four hours for baby back, and five to six for spares, which can take a little longer because they have a little more meat on top of the bone. Don't let them shrink much. You don't want to see the bones protruding! How to season: They're fantastic with or without a sauce, but if want to use a sauce, put it on at the end so it doesn't burn. I like a sweet, red Kansas City-style sauce. It's just perfect. What it is: The loin is the big long muscle that runs from the shoulder all the way down to the hip. It's a tube that tapers a little towards the end, and that's where most of your pork chops come from. It's very lean -- the opposite of ribs -- so you've got to be really careful not to overcook it. You can either soak it in a liquid brine or dry brine, which is when you sprinkle salt on it a few hours before cooking. This helps the protein hold on to moisture. If you want to put it in a bath of salt water, it works just about the same. 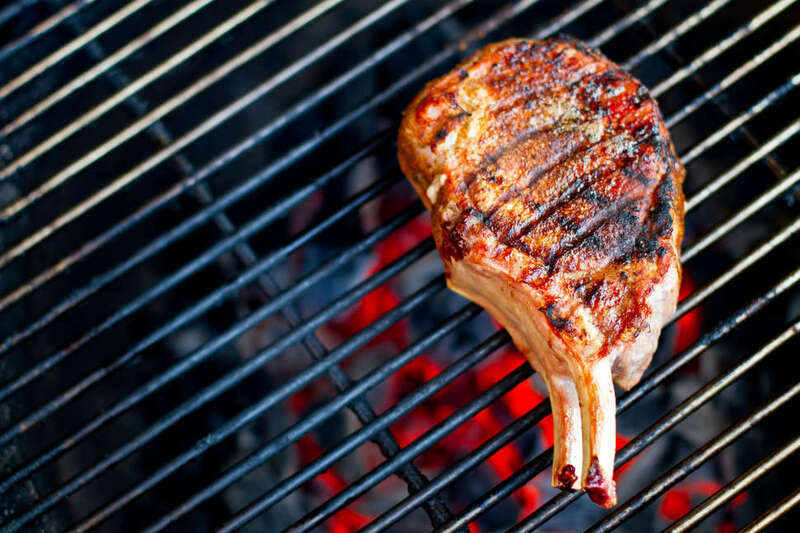 Grill it up: The temperature at which one grills should depend heavily on how thick the meat is. If it's a thick piece of meat, you can't cook it very hot or you'll burn the outside before the inside is done. If it's a 1/2in or so, you can cook it hot and fast -- you want a dark sear. Sear is flavor. I like to do a reverse sear. That means you start at a low temperature and gently warm them, and then you finish on a hotter temperature with the lid up. I like the taste of pork so I don't like to monkey it up too much. The USDA recently lowered the recommended serving temperature to 145 degrees, but I think there's a really easy case to be made that they're perfectly safe at 140. They're a little pink at that temperature, but they're so much more juicy. How to season: When it comes to seasoning, I'm a minimalist. It's a philosophy. 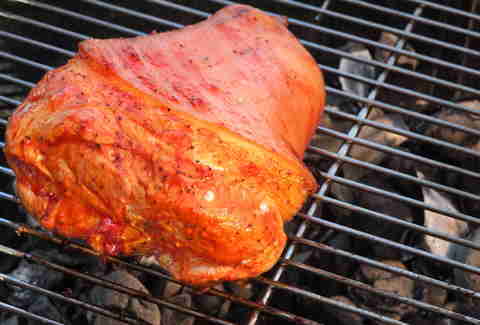 I like the taste of pork so I don't like to monkey it up too much, but pork does adapt to seasoning very well. I like to use a little paprika for color, garlic, onion, rosemary, and ginger (here's my recipe!). I also love mustard based sauces on pork like you'd find in South Carolina. What it is: Tenderloin is a long skinny muscle. A typical pork tenderloin is only a pound or a pound and a half. Pork loin can run 10lbs. They're very different. Pork tenderloins are really tender, really juicy. They're the filet mignon of pork! Grill it up: You've gotta be careful with this cut -- there's a narrow end and a fat end. So you always, always, always set up your grill with two zones. I lay the fat end over the hot zone and let the thinner end hang out in the cooler zone. When you're warming meat, cook with the top down -- that's roasting. Usually that's done in the indirect heat, or cool zone. But when you want to sear, lift the lid, move the meat over to the hot side and crank up the heat. Don't leave it there for long -- flip often. You're less likely to overcook the meat that way. Aim for about 140 to 145F. Get used to eating your pork a little pink. How to season: The whole tenderloin takes very well to some simple salt and pepper or a soy-based marinade or glaze, like a teriyaki or Yakitori sauce. I like to take these grilled tenderloins, chop them into bite-sized bits, and serve them on a bed of sweet bell peppers, onions, and rice with some cashews, some chopped chives, and a sweet and sour sauce. What it is: A pork chop is cut perpendicularly to the spine of the pig; sometimes it has a rib attached. Grill it up: You want to cook the interior of the meat first and then the exterior. That reverse-sear technique again. So first, take it up to about 130 in the indirect heat zone, then move it and sear in the hotter zone. Flip it every couple of minutes. While it's reverse searing, it will rise to about 140. How to season: I'm a big fan of my Memphis Dust Rub recipe for this. It's my recipe so obviously I'm in love with it, but people should be mixing their own spices because it's so much cheaper than store-bought. Plus, store-bought is almost always half salt. You want to apply the salt separately from the spice rub. So dry-brine or wet-brine the cut and put on the seasoning just before you cook. What it is: Shoulder is a complex weave of muscles, connective tissues, sinew, and fat, and it runs from the spine down to the elbow of the front leg. Shoulders can be sliced into steaks. There's a lot of fat on the shoulder. Once cooked, it freezes really well. 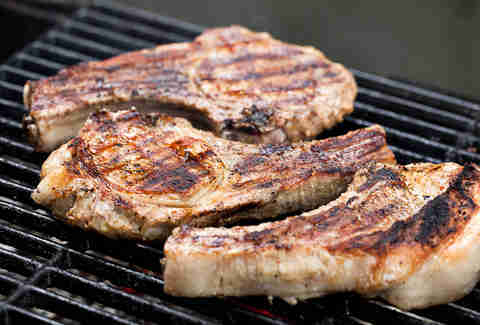 Grill it up: Usually you cook it for hooourrsss, low and slow, with the top down so it's a convection. Like, six to eight hours in indirect heat (remember, that means no flames underneath it) with the smoke circulating and you get pulled pork when you're done. You cook it all the way up to 203 degrees. 203 is the magic number. You really melt all those tough connective tissues and render the fat. How to season: Marinades are good for flavors you can't get from the spice rack, like fruits, but they take a lot of time and they don't really get that deep into meat. I prefer mine plain with a little BBQ sauce on a decent hamburger bun. I will, on occasion, give it a dollop of coleslaw. What it is: It's traditionally the hind leg of the animal. You can buy it raw, but rarely will you find it raw. It's better to get a whole ham or ham steaks, rather than canned ham. Grill it up: Usually it's cured, which means it's pre-cooked so it only needs to be heated. How to season: Because it's so salty, it works really nicely with sweet glazes. Jam and jellies are a great base for a homemade sweet glaze. All you need is apricot jam, a little white vinegar, or a splash of balsamic. A ham steak is beautiful with a sprinkle of garlic as well. Some brands are super salty! To diminish the salt, soak it for a couple hours in water. Away you go! What it is: Belly is a boneless cut of fatty meat. Grill it up: You want to cook it slowly so that all that fat renders. Then, you get a quick sear on at the end. For a 1/2lb cut of belly, I'd put it on indirect heat for an hour or so, and then move it over to the direct heat side. I flip it until it's crispy. I might even cube it so it can get it crispy on all sides. How to season: It's really great with Asian flavors. I like to make a quick pickle. I throw thinly sliced onions and cucumbers in white vinegar with spices and 30 minutes later you have these wonderful pickles for a banh mi-style sandwich. Carrie Dennis is a former food & drink editor for Thrillist. Follow her on Twitter: @CarrrieDennnis.